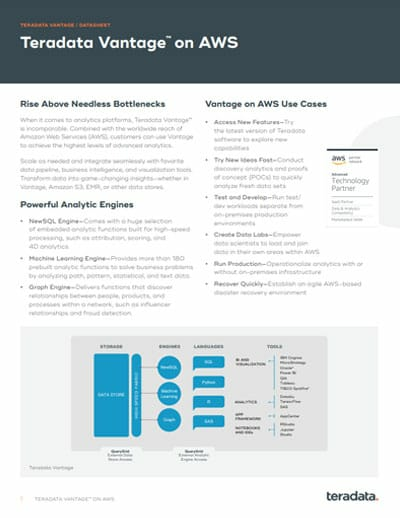 As-a-service for AWS and Azure It’s simple: we provision and maintain standard AWS and Azure infrastructure with powerful Vantage software so that you can focus on answers, not IT. You get a secure, scalable, single-tenant environment for analyzing all your data – and we take care of the minutiae. As-a-service for Teradata Cloud Teradata Cloud is what we call purpose-built Teradata infrastructure deployed in our own U.S. data centers. You get a secure, scalable, single-tenant environment with optimized performance and guaranteed Vantage uptime while we manage system operations on your behalf. Nice, eh? 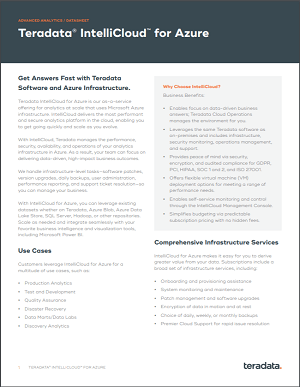 As-a-service for on-premises deployments Got A LOT of data and want all the benefits of Vantage delivered as-a-service, yet prefer purpose-built Teradata infrastructure with optimized performance to be hosted in your own data center? No problem. Our as-a-service offer for on-premises lets you maximize return on all your Teradata investments. Security is the number one priority when it comes to the as-a-service environments we provision and maintain for customers. Third-party audits demonstrate compliance with rigorous standards such as GDPR, PCI, HIPAA, ISO 27001, and SOC 1 and 2. Improve business continuity for on-premises systems with cost-effective public cloud storage and a Vantage system that is spun up only when needed. Back up your data to the cloud as frequently as desired using your existing Dell EMC Data Domain and Veritas NetBackup implementation. Need more? Want help? No problem. Teradata Consulting has more than 5,000 global experts to help architect, implement, and manage an your entire analytics ecosystem.